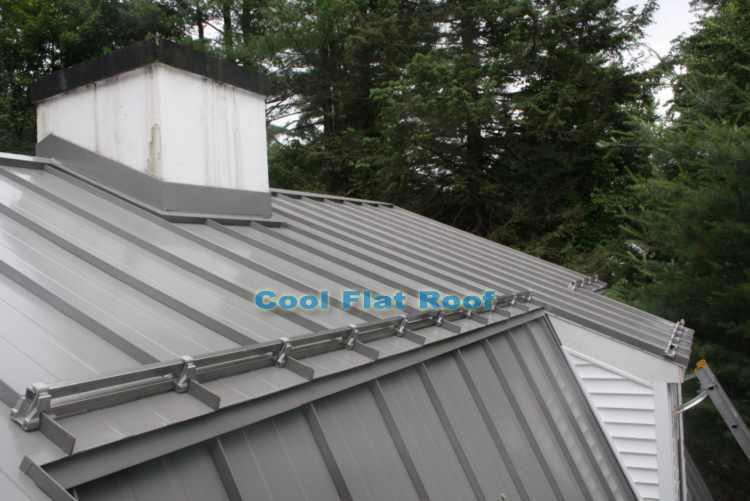 I will describe the roof problems that our customer in Andover, CT had, and what we did to eliminate the roof leaks, as well as give him peace of mind that his IB Cool Roof will protect his home, and provide real money savings on the ever-rising energy costs. In December of 2008 my wife and I awoke to a dripping sound in our master bedroom. Much to our dismay the drip quickly became a steady stream of water, as we were experiencing a rain storm that totaled 4″. We placed buckets under the stream to mitigate the damages. The next morning I opened up the Sheetrock ceiling which was sagging down. Upon opening the ceiling I could see that all of the insulation and plywood was wet. As I moved across the room I found that it wasn’t just that area that was leaking, but several places. 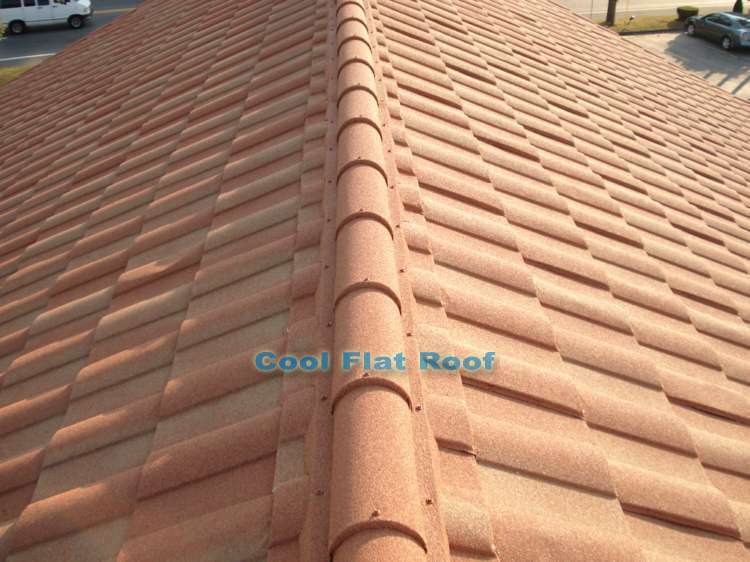 Our flat roof measures 20′ x 34′ and has a 1 pitch covered with 5 year old roll roofing. We tarped the roof and called a water damage restoration company to come in and dry us out. Unfortunately, MOLD was discovered growing on the underside of plywood decking, framing, and sheetrock. An industrial hygienist was hired to do testing and determine the mold spore levels. We ended up having to demolish the entire area and having the mold professionally re-mediated. The insurance company did not like to hear about mold. Their limit on coverage was $10,000.00 and we were facing $24,000.00 in damages! This is a very small amount when you see how much it can cost to remove mold. Insurance companies also will not pay to repair your roof. Especially a flat one. They will only cover the resulting interior damage. I was frustrated with the extent of damages that occurred all from what appeared to be a little leak. Often times, by the time water comes through your sheetrock it is too late and you have lots of mold and wood damage waiting for you. After settling with the insurance company I began to research possible ideas to make sure this never happens again. I investigated the idea of raising the roof pitch, which proved to be very expensive. 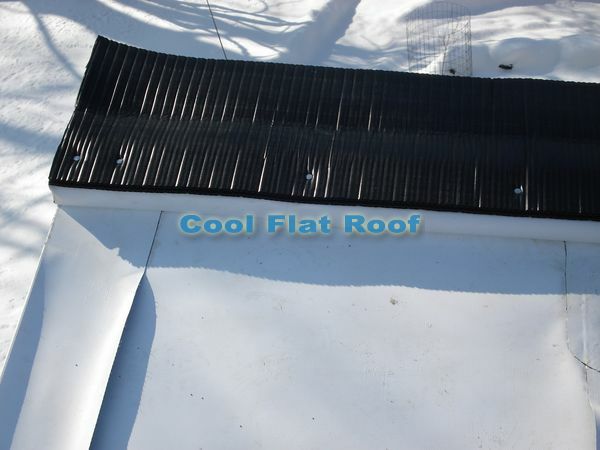 Next I looked into flat roof systems, such as rubber. I found that the seams end up leaking after a while. Not to mention the fact that it is ugly, and retains heat making the inside of your home hotter in the summer. I also looked into metal, but no one could install it on such a low pitch and guarantee me that it won’t leak. Finally, I found Leo’s website talking about the IB Roof system. I was amazed by the fact that this product provided a lifetime guarantee for the product and labor. I also loved the fact that it is attractive looking and reflects the hot sun keeping my home cooler in the summer. 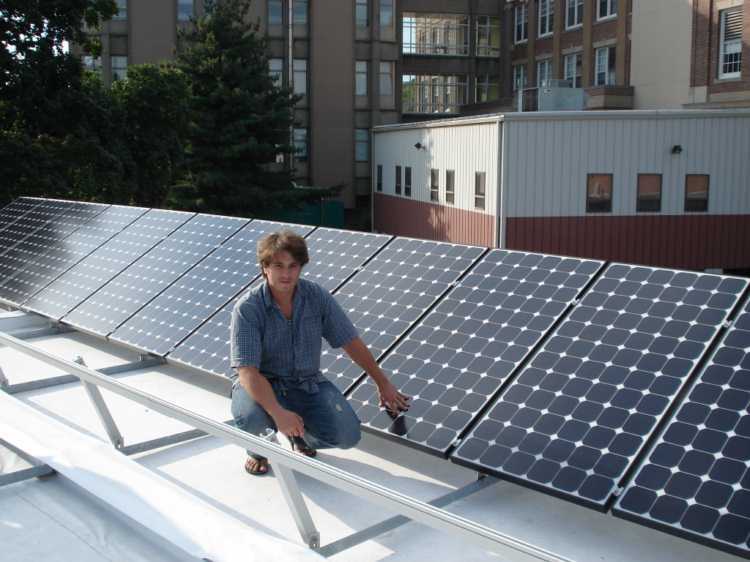 As an added bonus, in the future I can add IB solar panels to my IB Roof and generate my own electricity. I’m told that in some places the cost for IB Roof may be a bit more than the alternatives. However, for me the cost of the IB Roof was actually less than my quotes to go with a rubber roof. Therefore, it was a no brainier. Leo and his crew were on my job-site within just a few days after our initial contact. It was impressive to see how the construction was performed and you can really see the quality of the product. Leo and his crew were very respectful of our home and they kept the property clean. I have already recommended Leo and IB Roofing to a few people that I know have up coming flat roof projects. 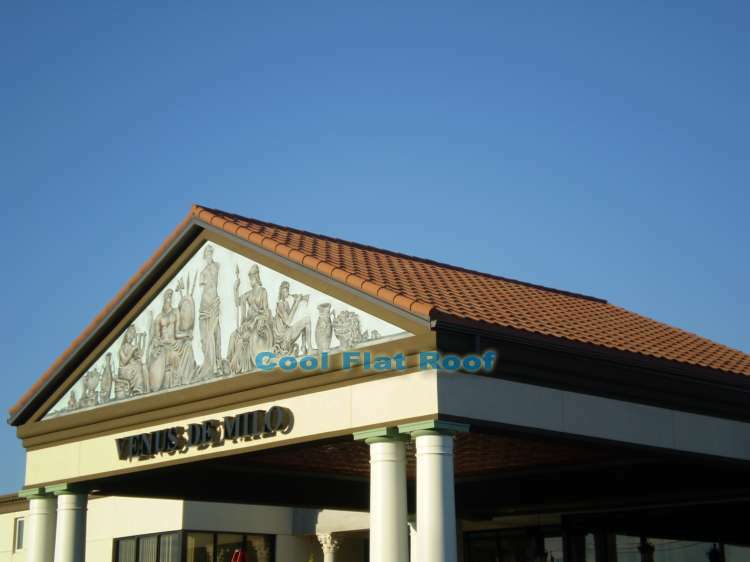 If you are considering a flat roof project you can’t go wrong with Leo and IB Roofing. Do it once, stay green, and enjoy! 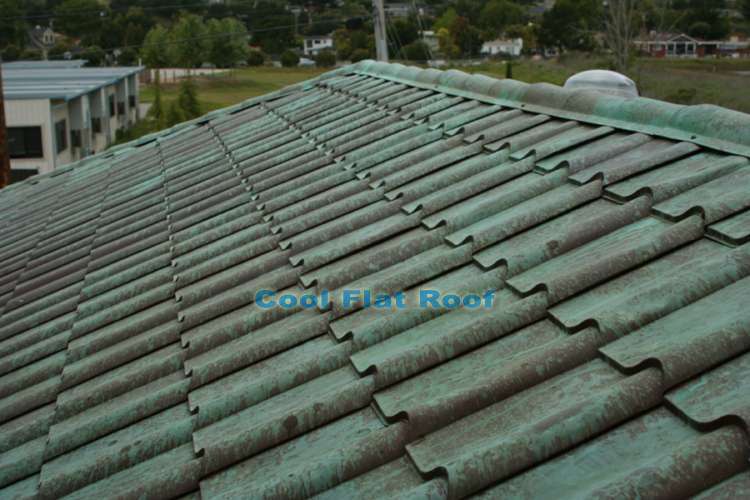 Roof problems, causes of leaks, and installation of a new IB Membrane. 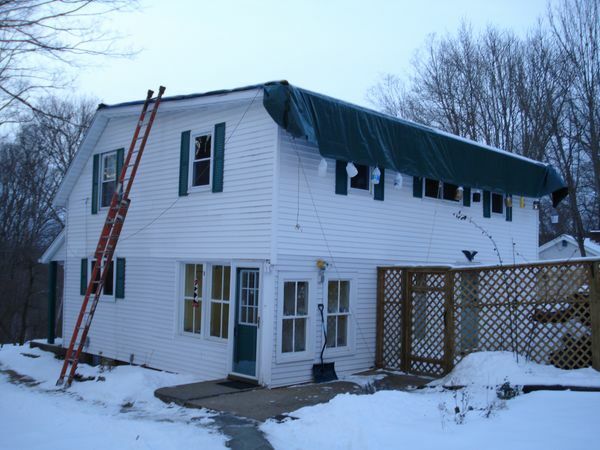 When I first met with Alex, the roof had an expensive, heavy-duty tarp on it and about 5 inches of snow. 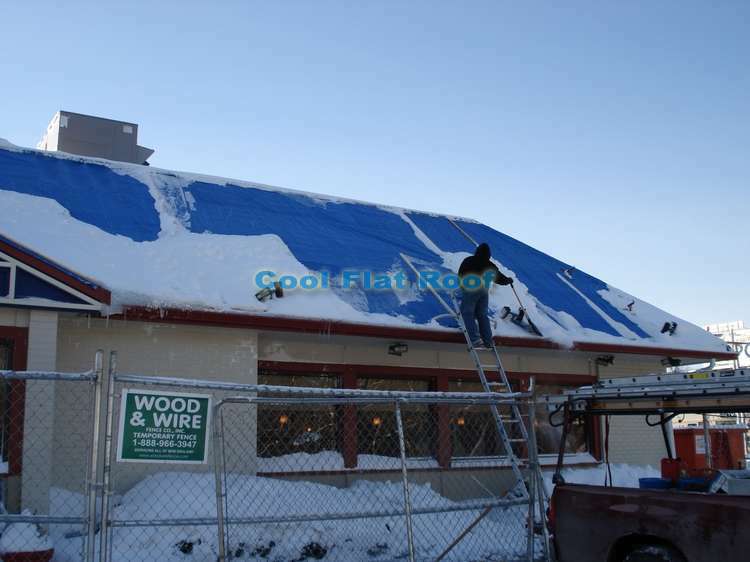 Although it was the time of a very cold arctic air front in New England, it was actually good for Alex’s roof as cold temperatures kept the snow from melting for a couple of weeks. Alex planned to tear-off the existing rolled asphalt roofing with the help of his friends over the weekend and, put the tarp back on, until we would come to install our roof. All went as planned, but it snowed the day after Alex and his friends removed the old roof, and replaced rotten plywood decking and fixed some rafters. On Monday morning snow melted and the roof began to leak again. 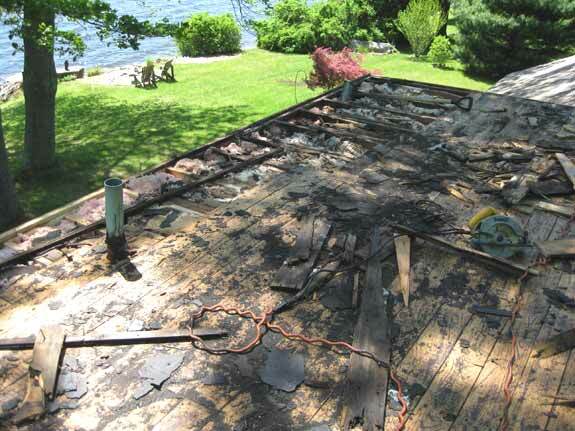 The heavy-duty tarp turned out to be damaged in few spots, and the roof was virtually unprotected. We had to adjust our work schedule to quickly come out and make Alex’s roof watertight, to prevent any more water damages and additional repair expenses. Fortunately, the weather was dry for a few days, and on Wednesday we came to install our roof. 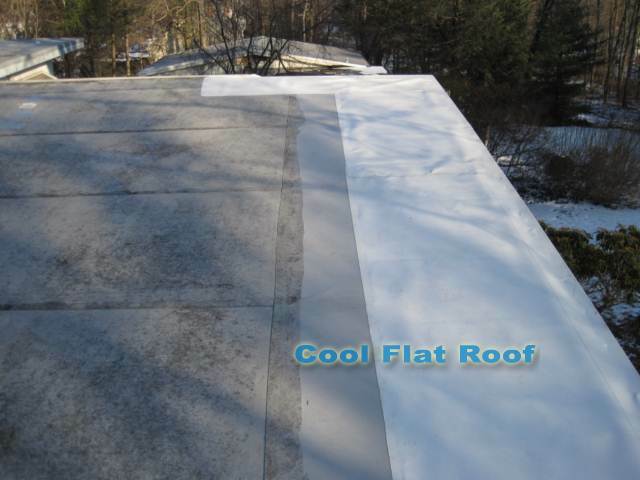 Once on the roof, we found that there were numerous causes of leaks. The major contributing factor was due to roof rafters caving in, and creating a cavity for water to puddle on the roof. 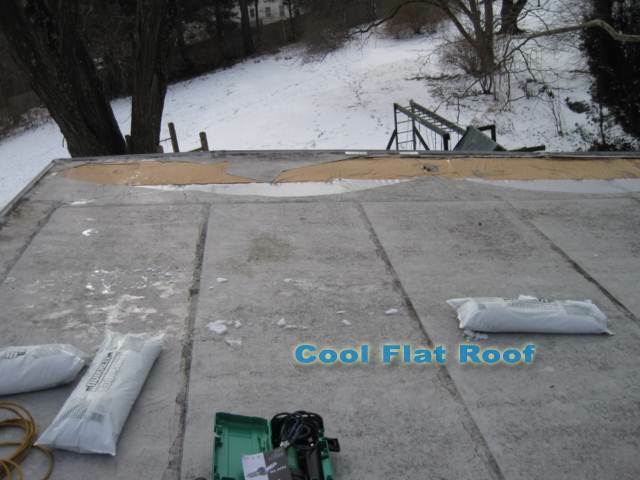 It is known among roofing professionals that standing water causes the majority of flat roof leaks. 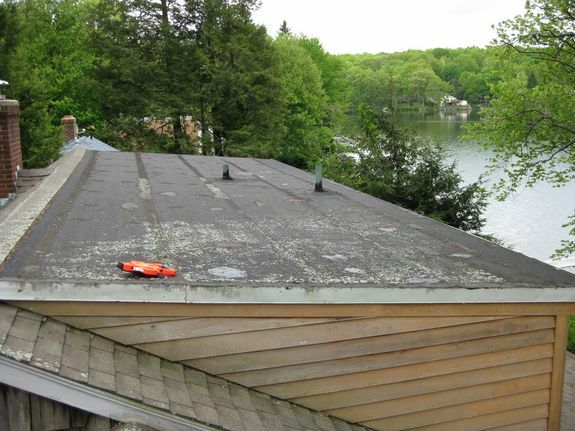 Standing / ponding water easily breaks the bond between roof laps, and enters the house, destroying insulation along the way. 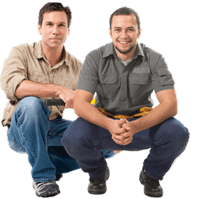 If left unattended, or unnoticed, these leaks will create thousands of dollars worth of damages, as well as pose a health risk – mold causes and/or aggravates allergies, asthma and other respiratory illnesses. My evaluation is that most water damages occurred were water ponded on the roof. 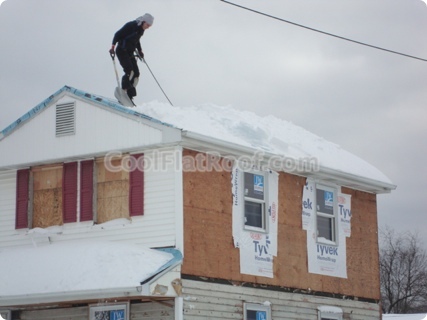 Other leaks occurred due to Ice Dams, where ice slowly “traveled” between the seams, and melted under the rolled asphalt, causing slow, but steady rot of plywood decking and mold. 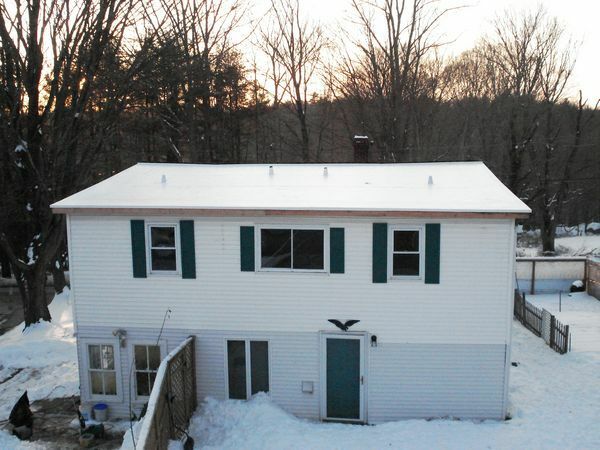 Although Alex’s roof is not completely flat, Ice dams are known to affect roofs that are completely non-walkable, so this very low pitch roof was an easy “prey”. 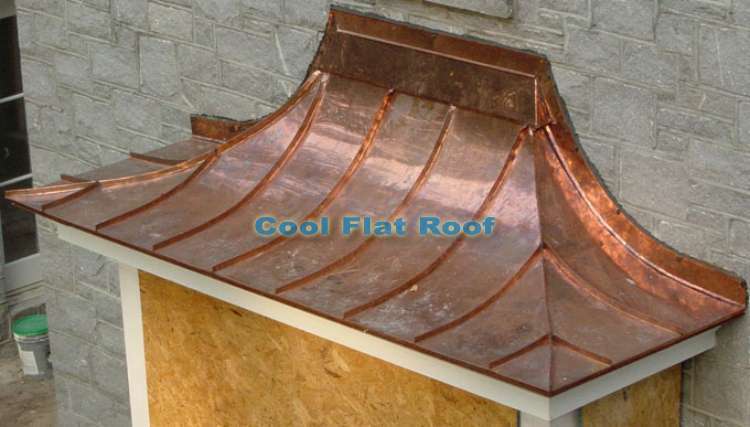 The reason why IB is such a great roofing system is the hot-air fusion welded seams. Once we weld two sheets of IB roofing membrane, a permanent bond is created, eliminating the possibility of water penetrations. 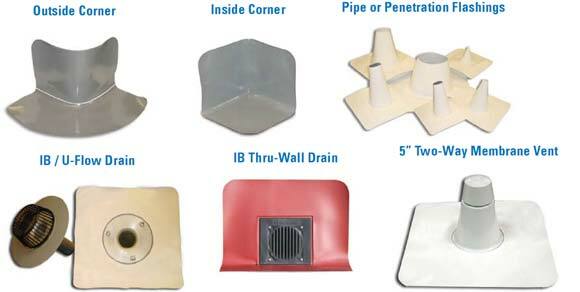 Additionally, IB manufactures all the flashing components, which speeds up the installation process, and minimizes installation error. Alex’s flat roof is actually an addition and was added as a shed dormer to a pitched roof. When this roof was constructed, builders put in a soffit / ridge ventilation system, which is always a good idea to have for wood roof frame / deck. However, a ridge vent can create many leaks problems, as it is very easy for water to be blown in by wind past the vent, and into the attic. 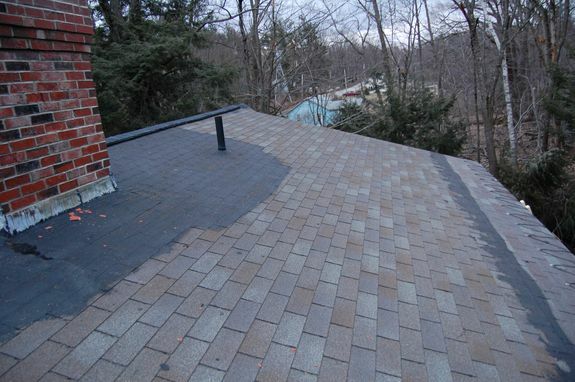 Normally, roofing contractors would just cover the ridge vent completely to eliminate leaks, but this would take away the ventilation, causing the plywood deck to dry out, de-laminate and slowly “dry-rot”. 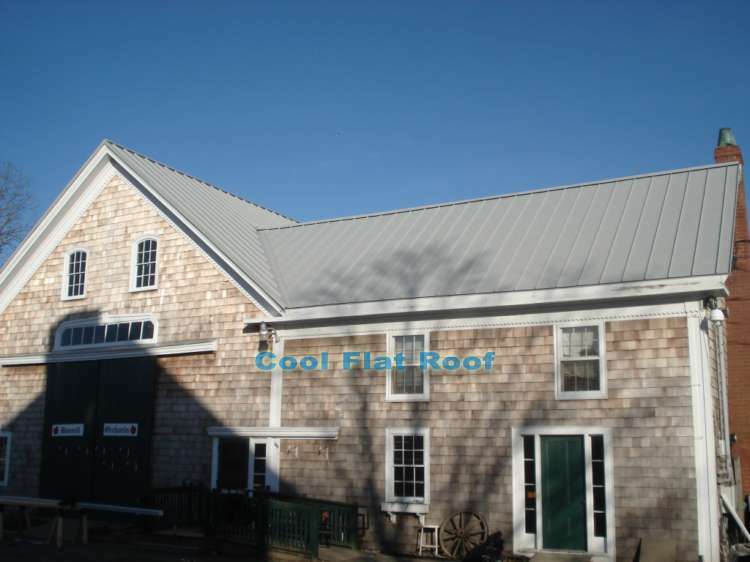 We have created a custom design ridge vent assembly for low-slope roofs and shed dormers, where the vent sits two inches above roof level, eliminating the possibility of wind driven water entering the roof. 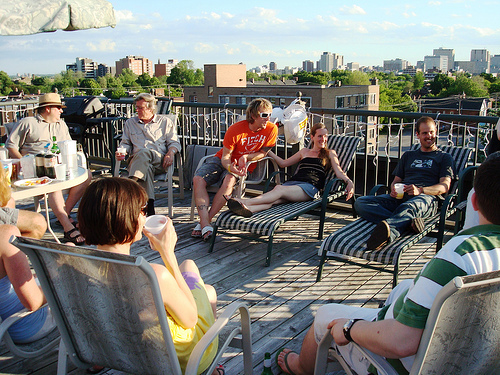 Although the installation of such assembly is tedious and consumes a lot of time, it is the right was to go to maintain proper ventilation and to preserve the roof deck. 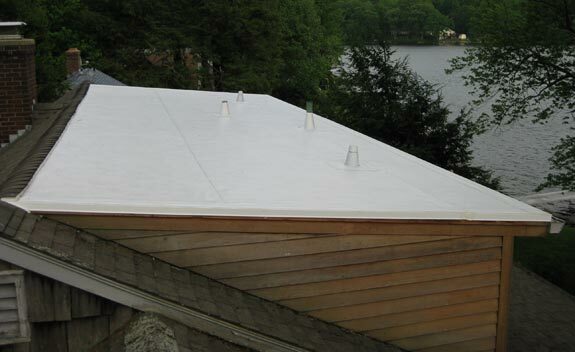 Ridge vent assembly for IB flat roof eliminates wind driven water leaks. As you can see from the picture, the ridge vent sits on top of a 2×4 wood, which is completely wrapped with IB membrane to create a water-tight barrier, and prevent leaks through the ridge opening. Overall, it was a straight forward installation which took 2 days to complete. Special thanks to Alex for providing us with delicious hot chocolate, which made our work easier and warmer during these cold January days. 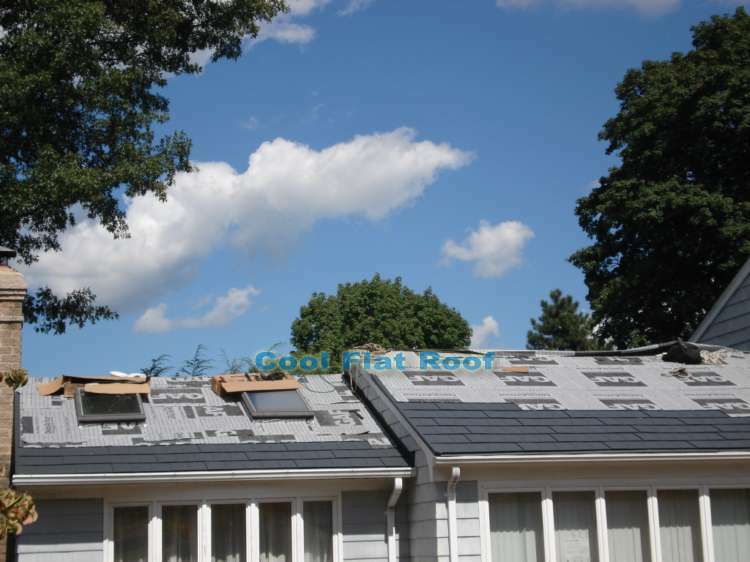 If you have a flat roof in Connecticut, Massachusetts or Rhode Island, you can fill our roofing estimate request form. 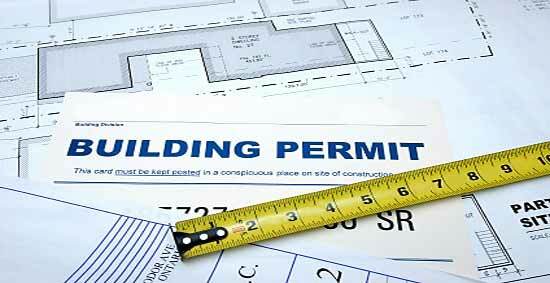 You can also get an instant price quote with our online Roofing Price Calculator.